1) I won the Indian accents contest on Stylepile the pictures of which you can see in this post. 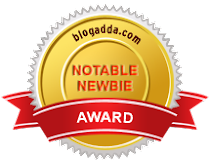 2) I have been featured in the Blogadda's Notable Newbie's Wall of fame. This was my OOTD on my husband's birthday . We started our celebrations with lunch at a nice restaurant and what better occasion to dress up ladylike. Ladylike dressing to me is a right mix of elegance ,sophistication and feminine dressing. It is transforming yourself from a girl to a woman. I decided to wear an animal print body-con cocktail dress gifted to me by my mom.A belt cinched my waist and made the whole look more polished and put together. I made a neat side bun and wore a red lipstick, which was to compliment the overall feminine vibe.For my eyes,I used nothing but loads of mascara on my lashes and curled them. How I did my hair ? To get a nice puff on the crown area,I backcombed my hair and fixed a bumpit inside.To seal the backcombing and puff, I used a hairspray which is very essential.Also,it is really hard for the backcombing to stay on very silky straight hair .So to ease it up, avoid using a conditioner for the crown area on that day. Also, look for a shampoo which doesn't make your hair very soft. In my case, herbal shampoo's(such as Green Apple from Biotique) makes my hair a bit dry and rough and perfect for getting a nice puff . For the bun, I gathered my hair on one side and twisted and rolled them and pinned them with a butterfly clip. This takes barely 30 seconds. I feel that the red wedges and a funky green nail paint are more appropriate for a more girlish and casual dressing.A nice pair of pumps would be ideal for this look. I wore these since I had a lot of walking to do and they are quite comfortable. A clutch bag would go perfect with this look . I was carrying a big bag which didn't go well with the whole look, but since I had to dump in a lot of my stuff ,it made more sense . Woww you look gorgeous Tanya <3 Lovely pics too!!!! Ohh.. i so like the red hot lips. you look gorgeous and nice work with the pics..
awesomeness <3 <3 <3 LOVE !!!!!!!!!!!! Love the dress!! looks good on you! got your blog from TrimmingsAndLace! hope you'll stop by my blog when you get a chance. Cute blog!